Roland “Rico” Chapa… This guy was a person who appeared to be guilty in blackjack scam during the St. Timothy Church festival. This occasion took place on the 9th of June, 2008 and it brought Chapa a lot of problems. He was noticed to have the same two cards (Ace of Spades and King of Diamond) several times during the game. 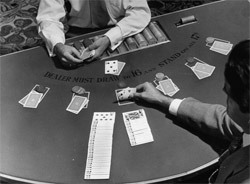 As Rob Gardner, the pit boss, said, the dealer who played with Roland that day noticed this unusual situation and supposed there was something wrong there. Chapa was asked to show his pockets and witnesses confirmed the fact he had some additional cards. Roland “Rico” Chapa was actually a bookmaker and gangster who had been wanted by the police for 30 years but they could not find any serious evidences to arrest him. It seemed they were lucky to do that this time. It was a very short process because it took only 30 minutes for the jury to charge Chapa with this crime. They wanted 2 years of prison for him though the defense attorney, Lewis T. Dye, tried to do his best to prove Roland’s innocence. He told jurors that Chapa was too drunk that night, so, he was not able to do blackjack scam. Roland Chapa himself tried to approve that he did not win but lost his money that night. When the verdict of his guiltiness was done Chapa told everyone that he had $650 but lost $200 of that money then; moreover, he approved that he wanted to leave $400 for the church and keep only $50 for calling a taxi. Well, it seemed to be that the 67-year-old dealer had completely lost his luck at that festival. The players who were at the same table with Chapa that day could not even say how many times he won because he played very quickly and the hands changed with high speed then. The authorities had been actually waiting for 6 months for a new chance to arrest Roland Chapa. His last case took place in 2007 when he was arrested for the organization of illegal bookmaking. But even this time Chapa has received the smile of fate. He appealed the jury’s verdict, and after one month’s process Roland “Rico” Chapa was sentenced only for 6 months of prison. They say, that Chapa offered the St. Timothy Church the contribution of $5 000.
Who knows where the truth is. Anyway, 6 months are much better than two years, aren’t they? And it seems that Chapa’s attorney will not lose his job. By the way, the father of Lewis T. Dye (our hero’s attorney) represented Roland Chapa in his previous gambling cases.